On Writing is both a textbook for writers and a memoir of Stephen’s life and will, thus, appeal even to those who are not aspiring writers. If you’ve always wondered what led Steve to become a writer and how he came to be the success he is today, this will answer those questions. This was the single best book I’ve ever read about becoming an author. I say this not because it was filled with some grand wisdom – although there was more than a little of that – or because it changed my life – though it did that, too. I say it because this is the only writing book I’ve read seven times cover to cover, trying to eke out every last drop of writing knowledge and information. I say it because the one thing to stick with me through every reading and beyond was this: write every single day. Give yourself a goal, and don’t get up from the damned desk til it’s done, even if it takes all day. Even if it’s worthless crap that you throw away wondering how in the hell you could ever think yourself a writer. Even if you show it to no one and delete it as soon as it’s written. This book, along with a blog or two and some sage advice from elsewhere, are not why I became a writer; they are HOW I became a writer. If King can do it, coming from the background he did and facing all the struggles he went through, then I can damn sure do it. And so I have. And this book, more than any other, helped that happen. 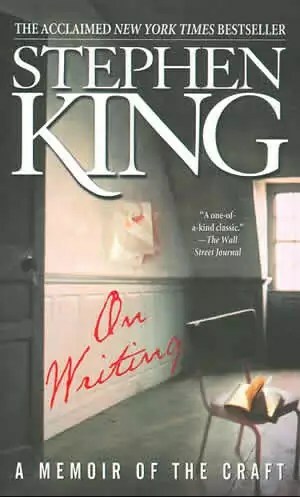 I cannot recommend a writing book higher than this one. Buy it. You will NOT be disappointed… unless you’re too chicken to write. P.S. – This book is way overpriced on Kindle at $13. Get the paperback, instead. @Neeks: I would have someone’s guts for garters if they did that, unless I thought it could help them. That said, I’ve read mine so many times it’s falling apart; need to buy a new one myself. This was a fan-TAS-tic book! I loaned my copy to someone and never got it back, so sad. But I will buy another, it’s great inspiration!